This fascinating look at the life and four voyages of Henry Hudson into northern waters is an excellent introduction to the explorer for whom the Hudson River and Hudson Bay are named. Written for upper elementary school-aged children, the book is well illustrated with full-page paintings that add to the text pictorially, and contains informative sidebars alongside the narrative. The hardships that early explorers endured are graphically depicted, and the political climate of the day is outlined. 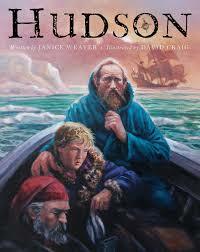 The author acknowledges that not a lot is known about Henry Hudson, especially his early years, and that he is often depicted in an unflattering way, but Weaver paints a portrait of a brave and determined man, whose dream it is to discover a northwest passage to China, and she encourages the reader to learn more about Henry Hudson with a note about other sources of information.